SAP Business Objects XI 3.1 Reports can be scheduled in Infoview, CMC and for Deski reports can be done through Desktop Intelligence tool. Infoview and CMC are the powerful tools to do scheduling. Below is the schedule scree where Desktop Intelligence tool is having Schedule option and there is a limitation to do schedule and it cannot be possible for event or calendar based schedule in Deski tool. This Deski tool is just to do normal report schedule. There are two methods you can start schedule through Infoview and both of them lean into the same process and it’s common for both Deski & Webi reports. Option 1: Select the report and right click and then select schedule. Option 2: Select the report and select actions in the Menu and then select schedule. Note: There is an extra PRINT option when you do Deski report schedule in Infoview and PRINT option won’t be available for Webi reports in the Scheduler. By Default Instant Title would be same as the Report Name and the same will reflect in the Format & destinations section in scheduler. You can change the Instance Title and it won’t impact anything in the original / repository report Name. 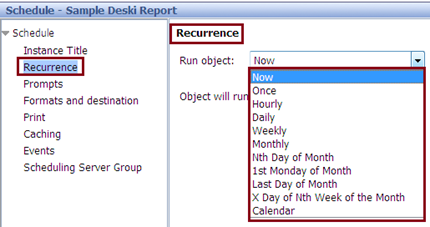 Recurrence option is to set the time line when the report should run and to define the repeating recurrences. 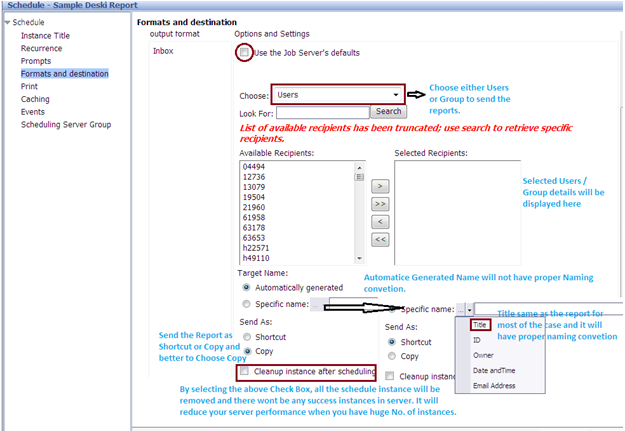 Below is the list of Recurrence is possible through Infoview scheduler. Now – Report will run now (immediately after the submitting Schedule). Once – Report will run only once based on the Start Time whatever you are setting up. 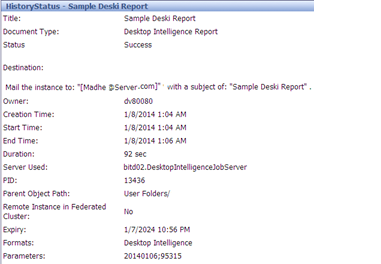 Based on the below example, report will run only once @10 AM on 1/3/2014. Start & End Date / Time will concept used when you go with event based schedule and will see in detail later. Note: None of the report will run after the end time that you specify. Hourly – Report will run every hour and Minutes specified in the schedule (0- 24 Hours schedule) and Start & End Date / Time would specify the from when the report should start and when to finish. Daily – Report will run once every Number of days whatever you specified in the schedule. For example, if you mention 1, the report will run every one day based on Start Date / Time and it will not run after the end time. If you mention 5, report will run every 5 days once based on Start Date / Time and until the end Date / Time. Weekly – Report will run every week on the following days (Monday – Sunday) based on the selection. If you select Monday, report will run every Monday based on the Start Date / Time. 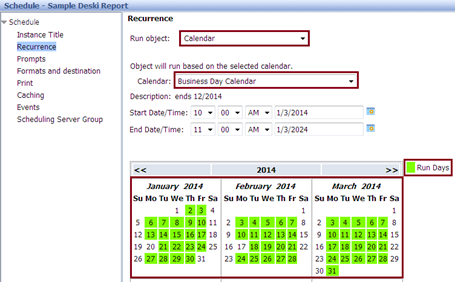 You can select either all seven Days or whatever the days you want to refresh the report in the days list. Note: At least one day should be select in the list. In the below example, report will run all the days in the week except Sunday. Monthly – Report will run every Number of Months (1 (Jan) – 12 (Dec)). For example, if you select 1, report will every Year Feb (2) Month based on your Start & End Date. It will allow you to select only one Month in the selection. Nth Day of Month – Report will run on the Nth day of each month. If you select 10, report will run every month date of 10 based on the Start Date. It will not run after the End Date. 1st Monday of Month – Report will run on the 1st Monday of each month based on Start Date. Last Day of Month – Report will run on Last Day of each month based on Start Date. X day of Nth Week of the Month – Report will run on any days between Monday to Sunday of any of the week (1- 5) of the month. If you want to run the report on every Wednesday on Second Week of every Month, below is the schedule method. Calendar – Calendar is the option, where you can create your own calendar settings based on the business requirement and schedule the report based on that calendar time frames. Calendar creation can be done through CMC (BO admin) and should be made to available to the users. Some of sample Calendars created in the CMC. 2nd Business Day of the Month – Admins has to create a calendar based on your company business and has to specify 2nd Business dates for each Month. Business Day Calendar – It will specify all the Business Day dates of your Company and report will run only on those days. Example, these kinds of calendars will be used for Daily Sales revenue / Bank transaction Dashboard report refreshes. Quarterly Calendar – Quarterly Calendar will be used to refresh the Quarterly reports and It will run the report after the Quarter Month Ends (March, June, October & December) and report will run first Business day of after the Quarter end. Same way you can create your own Calendars based on your business requirements and its really help users / Admins to schedule the report on the particular day / time without manual intervention. Prompts section is an optional for the report and non-prompt based report won’t have this section in the schedule. 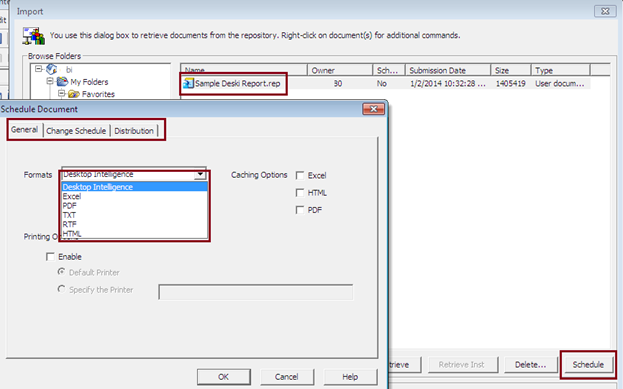 In this section will describe the output format of the report and how you want to deliver the reports to users. 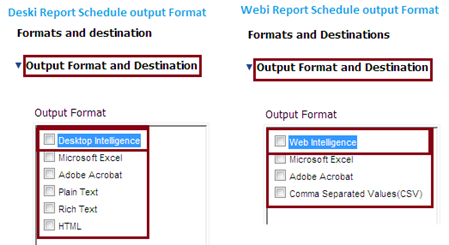 Webi and Deski reports are having different type of Output formats and below are Deski & Webi Reports available output formats. Both Deski & Webi reports are having same delivery methods. Below is the list of reports delivery methods (destination). Inbox – Send the reports to Users / groups of BO repository Inbox. User can access the reports from their BO repository inbox once they received the reports. Setup the destination details for Inbox delivery as mentioned below. • By default “Use the Job Server’s defaults” check box will be selected. This option has to be done at server side and most of the cases, scheduling will be done based on the User specific and this check box should be removed to get the additional features. When you selected File Location, the report should be saved in a particular file location which you have specify as mentioned below. Also the file location should have a permission from BO server to save the files. FTP server option to transfer the reports into some other server. This should have Host name of the destination server, User Name, password, account details and Directory where you have to store the file in that server. Email Recipients options to send the report into specific users / group of users e-mail account. You can Specify From (who is sending the report), TO (who is receiving the report) and CC (whom you want copy the report instances). Also you can provide information / message about the report in details. You have to select the check box “Add Attachment”, so that, report will be attached in the e-mail. This option is applicable only for Deski reports schedule. If you enabled the Print, it will select “Default Printer” which will be you server printer settings or else you have to specify the network printer information in “the Specify the Printer”. Caching is to enable fast online viewing of your report documents in more than one format (PDF, Html & Excel). The pre-cache in different formats allow you to view your reports in other formats (other than Deski / Webi Report) instantly. If you are not enabled the Caching option, you may have end up in waiting several minutes for huge volume of reports to be refreshed in PDF, Excel or Html. Note: Caching options for Desktop Intelligence Reports are only available when the reports format is set to Desktop Intelligence. If the format is set to Excel or PDF, the check boxes in the Caching section will be disabled. When you schedule the Deski reports in Deski format and sent to a user email inbox, a ZIP file containing Cached versions of files included with an attachment. The contents of a zip file generated with all three caching options are shown below along with e-mail page screen. When you do scheduling for Webi reports you will get one more option for Formatting Locales to Pre-Load the Cache. These Webi reports cache will store into Webi servers and it cannot be attached in the e-mail when schedule in Webi format and sent through e-mail. 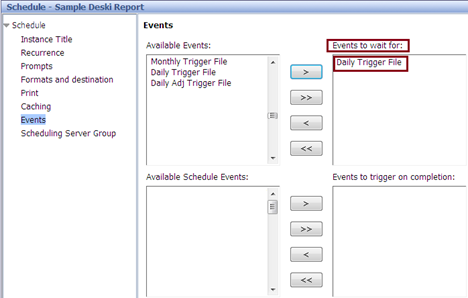 We can also schedule the Deski / Webi reports based on triggered events. Events will be created only in CMC (BO administrator) and available to users to schedule based on the created events. There are 3 different types of events. Custom Events: Custom Events can be done by calling Business Objects SDK functions and used to integrate reporting with other applications. 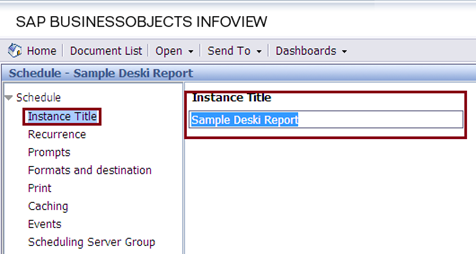 Any application or web service use the Business Objects SDK functions to raise an event to trigger the report. 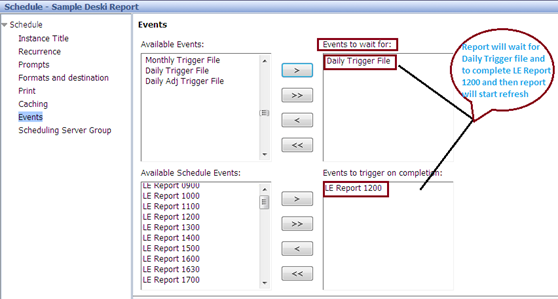 File Events: Business Objects Enterprise schedule server will watch for specific files to start / trigger an event. For example, you have ETL and completion of ETL load you have to place once file (Basically Dummy File) into the specific folder with proper file Name. In CMC, event will be cared by providing the below information. Path: \\BOServer\ftp\Trigger\ BusObject_prod – This will your servers specified location. Scheduled Event: This event is to define the events chain. For example, if you have a one scheduled report and want to schedule another report based on the first reports completion you use the Schedule event. By default it will select the first available server. If you want to change / specifically mentioned your cluster / Load balanced server you can provide in this section based on the group of available servers. 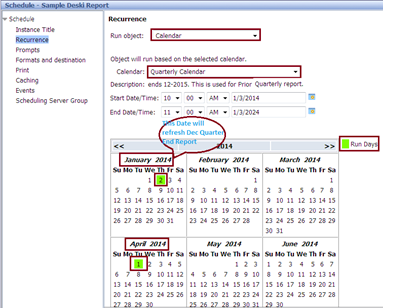 To view an existing Schedule / instance, right click on the report and select History. 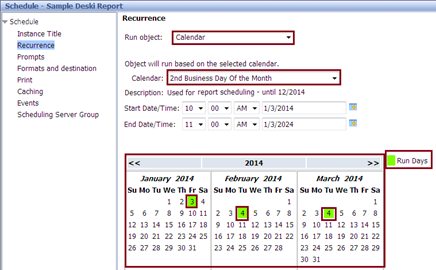 In the History page you can select the report and do re-schedule or delete the instances. In the History page you can see the report scheduled status (Success / failed / Recurring / Pending). By clicking the Status (Success / failed / Recurring / Pending) you will get complete information of the scheduled report. Below is the Success Status of Deski report schedule. Please share your thoughts on Report schedule. I had scheduled report once from my inbox. I dont see the option anymore. Any reason ? Hi, Which option you are not able to see? After following all of your instructions for scheduling a webi query and emailing the results in excel format via the cent mgt console, I am still not receiving the email. 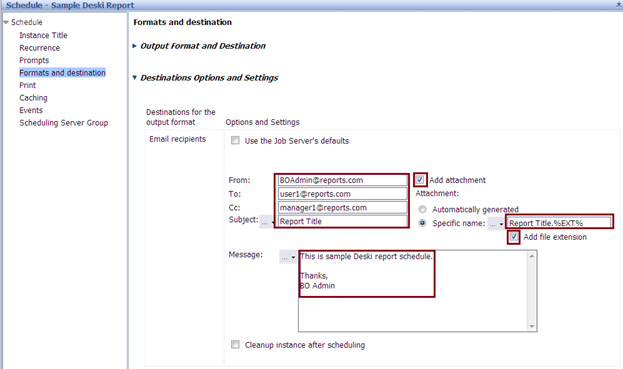 If I change the defaults within the active job server itself to send an email with the file to me, I receive the email. Doing this, however, will cause me a problem in the future if I want to automate multiple webi reports. Would you happen to know why scheduling in the cent mgt console is not working? Any common problems? Thanks. If you want to Use the Job Server’s defaults then BO Enterprise uses the email address associated with the publisher’s account. If the publisher’s account has no email address, BO Enterprise uses the Destination Job Server’s settings. 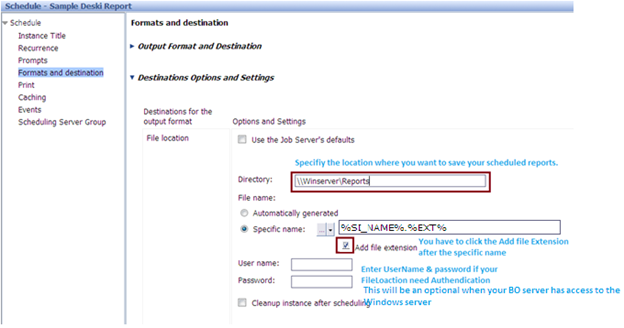 Before you use this destination, ensure that your email settings are configured properly on the Destination Job Server. I would like to know the details on scheduling reports to FTP location. Do I need admin ID creation for that? This Batch ID creation should be from CMC or from Windows? FTP the file to another server, you should have write access in that sever. Admin access from BO server required to contact the scheduled FTP server. You have to assign the access for FTP server from windows. Hi, you can get the prompt date automatically from universe. Create prompt with alias name use that static alias name in the prompt which would get the proper date universe. Hello, When I enter schedule option I don’t find them anymore if I want yo change them. How can I find the option that I configured? Right click the scheduled report and you will find the option called History (picture 1 below) and this option shown as per the infoview screen. You will see the history of that scheduled report events. Click that event and go to the option to re-schedule (you can edit with existing or create new) and do whatever the changes you want and click schedule. Hello, when I tried to re-shedule or pause the Reports , I found my Action button is grey, but my account is in the admin groups, and I have the general rights like ‘Delete instances’, ‘Pause and Resume document instances’. Could it be any reason for this situations, thanks in advance. Hi Vera, re-shedule or pause the Reports, I don’t think you should have a special permission and normal BO REPORT developer would have this rights. You check with you admin. I have same issue …When i done the changes while rescheduling ..next time when report again generate on schedule time it will not comes with changes ..Like i have added few new mail_ID’s . Hi, your question is not clear and what understood from your comments, you may not have recurring instance and if other person schedule the same report, your old scheduled (success) will go off. I would like to know how i can add the date (dd/MM/yy) in report name when Use Specific Name? Hi Bard, you can add date&time stamp in the specific report name section and you cannot format that date as you wanted in scheduler and it is system defined function. Hello, I am trying to create a new calendar in de CMC admin. Problem I am facing is that the dates are not correct. It is showing 21 February as a Monday….today is Monday 22nd February. If the dates are not correct in the calendar is depends on you r server setup. Please double check with calendar dates. For creating calendar based events (Example – exclude company holidays, first business day of every month, every month 1st, etc.,) you can create in CMC. I have BI4.1. how to run the failed webi report job in production using BI Launchpad and CMC? Right click the failed report in BI LaunchPad and go to History option. Select the failed instance (on top left hand side you will see actions) and select re-schedule. I want to do some changes for next run while reschedule. And i want that changes permanently. Once it run fine with changes but next it automatically run with the old values. Hi, you have to do with recurring instances based on time interval or based on events. This can be done depends in your project requirement. 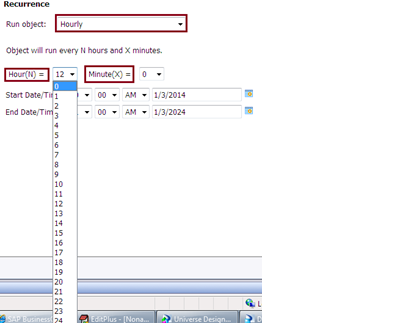 Hi, One of my colleague set limit for scheduled instance. Is there any possibilities to retrieve deleted instances.